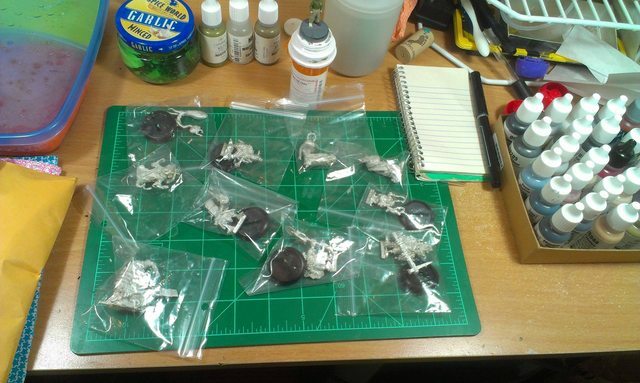 Home › Forums › Games and Other Creations › Low Life Miniatures › Let the Painting Begin! This topic contains 0 replies, has 0 voices, and was last updated by Thom.Shartle 5 years, 11 months ago. Oh. They’re not saying that anymore, huh. I was about to say the same thing, Crudeboy. I’m sorry, I just realized that could have been construed as being snarky. I had pictures of the minis basecoated in mind when I wrote that, as I’m curious to see others’ color schemes and such. Are you planning on painting them as they’re illustrated, Thom, or something different? No worries mate! I will prolly go for as illustrated-ish! I’m really excited to see the painted minis. I haven’t had time to paint any myself. I almost wrote, “I haven’t had time to paint myself”, but that would just be a lie. I paint myself all the time. I paint myself all the time. Looking forward to seeing some painted minis! Mine should be done sometime after the Great Flush…. So what’s your prime base coat going to be? I’m debating grey so that I can go up or down on paint colors. I’ve recently gone back to priming in grey simply because it’s a good middle ground for pretty much anything and, y’know, effort. Brighter paint jobs benefit from white priming, darker with black, etc. It takes a lot more work to get good bright colors on darker primer. More highlights of gradually lighter paint and such. If you really want to get kooky you can start doing this “zenithal priming” thing all of the superfreaks are into these days. Also, I’m sick of rattle cans. It’s time to invest in a cheap airbrush and to rig up a halfway decent spray box even if it’s just for priming. zenithal priming? I’ll have to look for it (as I’ve not heard of that), but I’m thinking greys for most will work best for me. I use Citadel Chaos Black or White depending on the intent. They are not primers per se – they apply a much thinner coat. Primers are meant to fill in cracks which I don’t want. I’m hoping this weekend to have a few minutes to at least prime and get these bad boys ready to paint. Zenithal priming is where you… I suppose you could say, “hard prime” the shadows and highlights, if that makes any sense. The simplest way to do it is just to hold the figure upside down, prime black to get all the dirty dirty underbits, then turn it upright and prime white straight down onto the mini. You’re supposedly then left with the most exposed and light-catching parts with a brighter prime, and the recesses darker. I haven’t tried it myself, but I figure I’ll end up giving it a shot one of these days. Most likely after a few beers and the acquisition of a wild follicle up my backside. Primers are used to provide a good “tooth” on a smooth surface for the paint to adhere, however a halfway decent brand of spray paint (I use Krylon) will often work just fine. I’ve also used plain ol’ brush-on artist’s gesso to decent effect, despite it drying to a slightly rubbery, unsettlingly fleshy texture. yeah, i love gesso in that it isnt as finicky about temperature and humidity as spray primer, but do i trust it? heck no…. if you like brush on primer, i really must recommend the GW Imperial Primer. like all things GW, it’s expensive and annoying that it only comes in black, but it has a ridiculously smooth finish and sticks to plastic and resin like nobody’s business. metal not so much, but better than their sprays anyways. Reaper’s brush-on isn’t too bad. I’ll mainly use it for touch ups and such. Yeah, Duplicolor is great stuff. I’ve never really been a fan of brush on primers. I tend to use armory’s (or did back in the day); I’m HOPING to be able to get to the local gaming store (Gamma Ray Games) and see what they have for spray primers.